Guest rooms feature contemporary decor with stylish furnishings including the Hyatt Grand beds, state-of-the-art media and work center with a high-definition 42 inch flat panel television that easily integrates with laptops, a comfortable cozy corner L-shaped sofa-sleeper, wet/dry bar and bathroom vanity with granite counter tops. Enjoy complimentary wireless high-speed internet. Enjoy our complimentary a.m. Kitchen Skillet, with hot breakfast items, fresh fruit, oatmeal and plenty more to choose from. Served daily from 6:00am-9:30am (Monday-Friday) and 6:00am-10:30am (Sat-Sun) in our Guest Kitchen. Pet Policy - 1-6 nights a 75 Non-Refundable fee. 7-30 nights a 75 Non-Refundable fee plus an additional 100 cleaning fee. Maximum of 2 dogs per room are permitted. Weight must be 50 lbs or less max of 75 lbs per room. Fees are in USD. Service Animals are exempt from fees. A special event cancel policy for the Super Bowl is in place for 03FEB17 - 05FEB17. During this time all reservations are Full prepayment Non-Refundable. 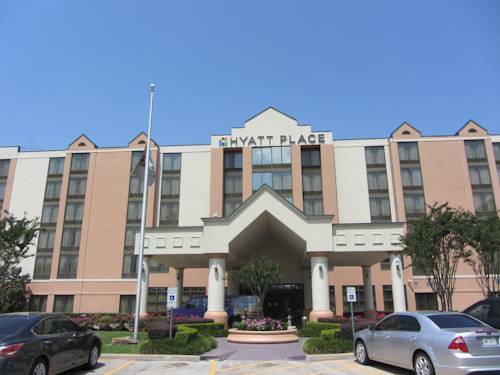 Conveniently Located off Beltway 8 in the Greenspoint corporate area minutes to George Bush Intercontinental Airport, I-45, US-59, and the Hardy Toll Road. 24HR Cancel - Must cancel by 24hr of arrival to avoid loss of one nts room and tax. A special event cancel policy for the Super Bowl is in place for 03FEB17 - 05FEB17. During this time all reservations are Full prepayment Non-Refundable.